Heat oven to 350°F. Lightly grease 12x8-inch (2-quart) glass baking dish. In 10-inch skillet, melt 3 tablespoons butter over medium heat. Add onion and bell pepper; cook and stir until crisp-tender. Add eggs; cook, stirring occasionally, just until eggs are set but still moist. Fold in shrimp and mushrooms. In 2-quart saucepan, melt 2 tablespoons butter. Add flour; cook and stir until smooth and bubbly. Gradually add half-and-half, cooking and stirring until mixture boils and thickens. Add Swiss cheese, Parmesan cheese and wine; stir until smooth. Fold sauce into egg mixture. Pour into baking dish. Remove dough from can in 2 rolled sections. Do not unroll dough. Cut each roll into 6 slices; cut each slice in half. Arrange 20 slices flat edge down around edges of pan; arrange remaining 4 slices in center. In small bowl, mix 1 tablespoon melted butter and the parsley; brush over dough. 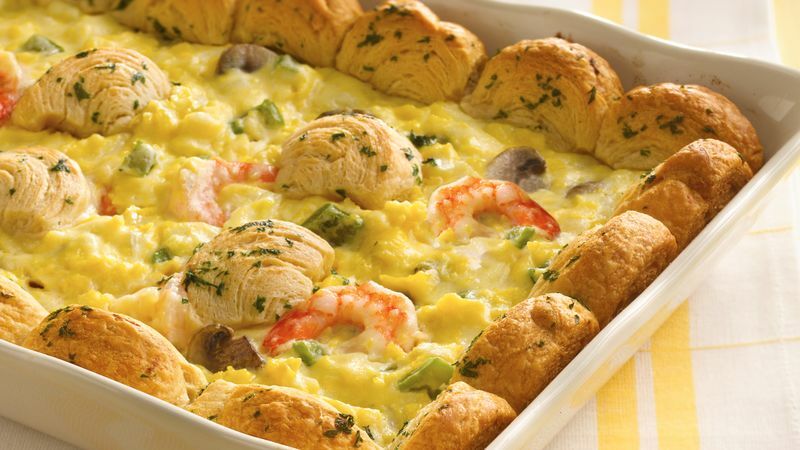 Bake 25 to 35 minutes or until eggs are set and crust is golden brown. Let stand 5 minutes before serving. Garnish as desired.